Enhanced Services form the third tier of the community pharmacy contractual framework and are commissioned and funded by Health Boards. 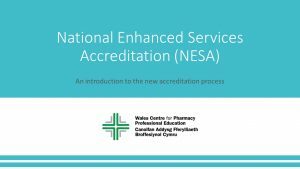 In order to provide National Enhanced Services in Wales you are required to undertake an accreditation process and reaccredit every three years thereafter. The new online accreditation process has been designed to improve access to training and assessments. It will also help pharmacy professionals strengthen the skills necessary for effective delivery of enhanced services. It is strongly recommended that you read the sections below for the National Enhanced Services Accreditation process, which has been updated as of 3rd April 2018. This includes a tutorial on how to navigate the new NESA Hub. Please click to read the introductory guide below or watch the tutorial on how to navigate the accreditation process. What happens if I fail the virtual patient assessment 4 times? You will not be allowed to attempt that assessment again for 30 days, after which a further 4 attempts will unlock. You will have a maximum number of 8 attempts for this assessment. If you fail after all 8 attempts, you will be required to attend a training event provided by WCPPE and complete another virtual patient assessment using a different virtual patient case, for which you will receive another 4 attempts. What happens if I fail the video critique assessment 4 times? You will not be allowed to attempt that assessment again for 30 days. You will need to contact us 30 days after your fourth attempt to get your attempts reset. You will have a maximum number of 8 attempts for this assessment. If you fail after all 8 attempts, you will be required to attend a training event provided by WCPPE and complete another video critique assessment, for which you will receive another 4 attempts. My accreditation expires in between 1 October 2017 and 1 April 2019. How do I reaccredit? To submit a reaccreditation form to Shared Services and continue providing enhanced services, you must have successfully completed all generic skills and competencies assessments by 31 March 2019. However, if you are due to reaccredit before the end of March 2019, Shared Services have allowed a “grace period” which means you will remain on the All Wales Database and can continue to provide that service, providing that you do pass all the generic skills and competencies assessments by end of March 2019. If by 31 March 2019 you have not completed all generic skills and competencies assessments and submitted your re accreditation form, you will no longer be able to continue providing this enhanced service. If not everybody passed the assessments during the pilot, does that mean not everybody will pass before 31 March 2019? No, the pilot was there for us to test the process as much as it was for participants to tell us how it could be improved. The feedback from the pilot has helped us make the necessary changes to ensure the process is fair and robust and that everybody has the necessary tools to pass it. I have been providing Enhanced Services for a very long time. Why do I have to be assessed on my consultation skills? The Welsh Government will be requiring more from pharmacy services and pharmacy professionals. The new accreditation process has been designed to support pharmacy professionals and ensure they have the necessary tools to provide services to the required standard. The frameworks used are new to the pharmacy profession in Wales, therefore appropriate assessment is required for all pharmacy professionals regardless of how long they have been providing services for. Why do I have to wait for 30 days in between my sets of 4 attempts? The new accreditation process is not just an assessment tick box exercise. It has been designed as a learning process that can contribute to your Continuing Professional Development. It is important to take the time to work through the learning material. The break in between attempts is there to allow for adequate learning time in between assessments. I am a pharmacy technician. Do I have to go through the same accreditation process as pharmacist? Yes, if you want to provide enhanced services, you must undertake the same process to ensure the service is provided to the same standard. Will I need to pay a fee to obtain initial accreditation? No, there will be no charge for initial accreditation as of 1st April 2018. The entire process will be online and free. What happens if I don’t pass generic skills and competencies assessment before 31 March 2019? Your accreditation for the enhanced services you currently provide will lapse, you will no longer be able to provide the service and you will need to go through initial accreditation again. How is it best to go through the process? We have designed a tutorial for you to watch before starting the new accreditation process. Please access this from the tutorial section below. What is the process for the Flu service? You will need to pass Generic Skills and Competencies as for any other enhanced services. Details of requirements for initial accreditation/ reaccreditation for the Flu service are currently being reviewed with the Health Boards and will be made available in due course. How long will it take to go through the entire process? The only mandatory elements of the process are the assessments, which are timed. If you were to take the maximum time to go through all assessments you would need 3.5 hours for competencies and 3 hours for skills. In addition if you were to take the maximum amount of time for clinical knowledge you would be adding another 30 minutes for EC, Substance Misuse and Care Homes and/or 45 minutes for Smoking Cessation. Learning time is entirely dependent on you and it will vary based on the learning resources you choose. As an example, most competencies e-Learning modules take 1-2 hours to go through. Why are we being assessed through virtual patients (avatars) and video critique? Consultation skills need a more practical assessment. Assessing skills through an OSCE style exam is not feasible due to the number of community pharmacy professionals in Wales. It would be costly, time consuming and inconvenient for pharmacy professionals to be assessed this way, hence why alternatives were needed. The simulated Avatar consultation is more advantageous because it is easily available and accessible – it provides a fair, objective and standardized assessment at the end of which tailored feedback is provided. Due to its limitations, i.e. the ability to assess body language, empathy, tone, etc., we have combined this assessment with video critique, in order to assess the full range of skills required. Please note that the assessments are not testing your own consultations, but your ability to apply the framework in standard consultation and critique practice based on the framework. Why has the accreditation process changed? The Welsh Government wants pharmacy to take on more patients and provide more services. The previous accreditation process was seen as a barrier to pharmacy professionals accrediting in a timely manner, therefore it was decided that the process needed to be more streamlined and accessible. Further, the process needed to incorporate assessment of consultation skills, which could have not been achieved through the old process. Please refer to the NESA launch pack for further information. Does failing a skills assessment mean my consultation skills are not up to standard? No, failing a skills assessment is not a reflection on your current ability to provide enhanced services. The consultation skills we are assessing will be new to the majority of pharmacy professionals and are based on standard frameworks. The assessments will be testing your knowledge and application of the framework rather than giving you a ‘one size fits all’ consultation that you should follow in practice. Will the assessments be available in Welsh? Due to the tight timescales for the change in accreditation process, we will not be able to provide the assessments in the Welsh language before 31 March 2019. However, we have already applied for funding to create the assessments in Welsh and it is something we are actively working on. What if I had started to complete an assessment for an enhanced service module before NESA was launched? You can continue to print out certificates for assessments that were passed prior to the launch of the NESA hub. If you started an assessment but didnt finish, or didn’t complete all assessments in that course module, unfortunately you will not be able to continue with those assessments and you will need to complete the new assessment through the NESA hub. Please check your details below and click submit. Once you have done this, please visit your learning dashboard where you will be able to access the NESA hub via the Nesa tab or the individual courses via the assessment and elearning tabs.